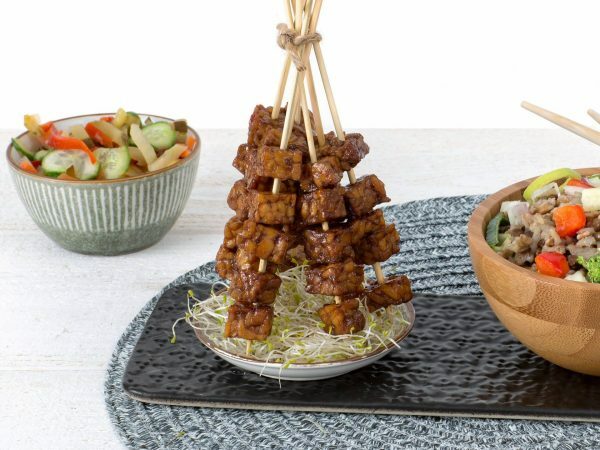 Delicious Tempeh Cubes marinated in a ketjap marinade. Stir fry the cubes in wok dishes or use them in Oriental dishes. This product is made from cooked and fermented soybeans and are purely vegan. A package of vegan Tempeh Cubes Ketjap contains 180 grams. 59% boiled soy bean, 25% sweet soy sauce (water, molasses, Sugar, soy sauce (water, soy bean, salt, vinegar), salt, red peper, vinegar, modified starch, onion, ginger, lemon juice, garlic, herbs and spices, natural flavouring), sunflower oil, rice flour, inoculum cultures. Produced in a facility that processes peanuts and nuts. Frying pan: 3-4 minutes. Turn every now and then.